Train No. 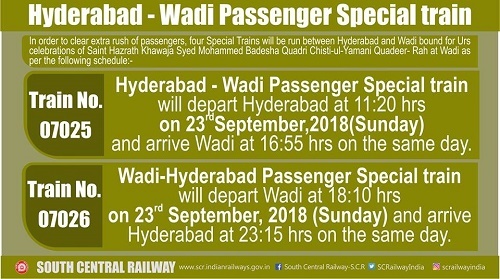 07025 Hyderabad – Wadi Passenger Special train will depart Hyderabad at 11:20 hrs on 23rd September, 2018 (Sunday) and arrive Wadi at 16:55 hrs on the same day. In the return direction, Train No. 07026 Wadi-Hyderabad Passenger Special train will depart Wadi at 18:10 hrs on 23rd September, 2018 (Sunday) and arrive Hyderabad at 23:15 hrs on the same day. Train No. 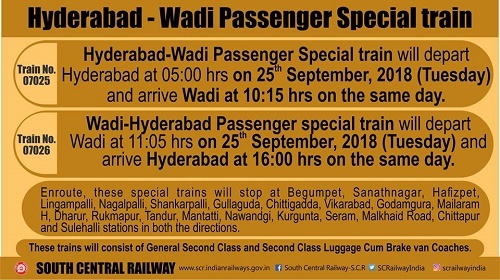 07025 Hyderabad-Wadi Passenger Special train will depart Hyderabad at 05:00 hrs on 25th September, 2018 (Tuesday) and arrive Wadi at 10:15 hrs on the same day. In the return direction, Train No. 07026 Wadi-Hyderabad Passenger special train will depart Wadi at 11:05 hrs on 25th September, 2018 (Tuesday) and arrive Hyderabad at 16:00 hrs on the same day.